The day was organised by Caithness Field Club who arranged for two boats to take people over to Stroma to walk wherever they wanted to go. The last time I was there was in 1988 and nothing much had altered or changed in that time. The weather was misty with and the ground was wet although the road that runs the length of the island is in very good condition. Many people from Stroma settled in Caithness but many have also scattered round the world. This map shows the last owners or tennants on the island in each property. The island still supports sheep and cattle and has some excellent pasture land. Good crops of hay are still taken to feed the animals. Only two houses are now regularly visited by the families who lived there in addition to the present owner whose family also came from Stroma. The island is now a paradise for birds that have colonised the island as with few people to worry about they could and have chosen to nest everywhere from the open ground to the empty houses. Thousands of terns particularly at the north end were looking after their young and made it noisily known they would rather you kept away. The lighthouse now unmanned still sends out its light now automated and the fog horn was still booming its warning on the day we were there. An eerie sound as ever it was and one not heard in Wick since they stopped the signal a few years ago. Where Will We Go On Stroma? Eventually Bill will be visiting all of the buildings and add to the pictures and even replace many of the ones that will appear in coming weeks from this visit.. So if you look in from time to time you can join Bill on his trips around the island. If you are be interested in going with Bill next summer in July or August 2002 send an email to bill@caithness.org and he will get in touch regarding arrangements once numbers are known. From the lighthouse in the north to the harbour in the south, the old school, shop church and houses - all will gradually appear in this section in coming weeks and months. 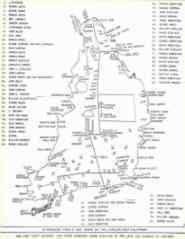 See where the islanders lived and how for their island time is only gradually bringing their places to an end. For many years even hundreds of years the walls will stand but in the next two decades the roofs will have probably have gone on the empty houses no longer maintained leaving only one or two still able to be occupied.